Please join us this Saturday, Oct. 22 at 11 am at the wonderful (but endangered) Sportsmen’s Lodge on Ventura Boulevard in Studio City as the Coalition to Preserve LA and several Community groups hold our very own town hall on over development, traffic gridlock, and harm to our neighborhood character – — and what we can do about it in the San Fernando Valley. The Town Hall will be held at the Sportsmen’s Lodge Waterfall Room, 12825 Ventura Boulevard, Studio City, this Saturday, October 22 between 11 a.m. and 1 p.m. Free parking is available. Enter off Ventura Boulevard and drive to the back lot near the fence. Featured speakers include Coalition to Preserve LA leaders Jill Stewart and Jay Beeber; Sherman Oaks Homeowners Association president Richard Close; and Crenshaw Subway Coalition executive director Damien Goodmon. Numerous oversized mega-developments that need profitable spot-zoning favors from City Hall have been proposed for the Valley. Hear from every day people trying to save their communities from these out of scale projects that destroy the character of our neighborhoods. Residents will have the opportunity to ask questions and share their experiences. It’s an important way to let your voices be heard and connect with others. 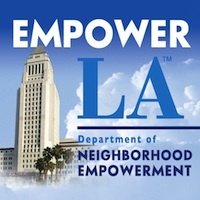 The Coalition to Preserve LA sponsors the Neighborhood Integrity Initiative, which will return power to communities. Co-hosting the Town Hall are the Studio City Residents Association, Chase Knolls Residents and Neighbors Association, the San Fernando Valley Neighborhood Coalition, and North Hills West Homeowners Group. Our invitation flyer is attached.